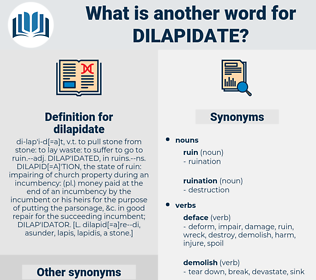 What is another word for dilapidate? beautify, adorn, create, fix, build, repair, embellish, aid, ornament, mend, smooth, help, decorate, grow, cure, heal, construct, improve, assist, benefit. lose, surrender, rebuild, produce, raise, strengthen, fasten, restore. be born, continue, enlarge, enhance, advance, begin, increase, rise, forge, forward, bear, prolong, extend, develop, live, reach, appear, win, arrive, start, commence, flourish. collect, meld, unite, couple, connect, put together, attach, gather, combine, join, link. coagulate, unmix, marry, concentrate, integrate, solidify, assemble, resolve. please, approve, care, make happy, yield, respect. inspirit, encourage, expand, give, let go, invigorate. delft, dilapidated, delapidate, dolobid, didelphidae.